We have some exciting news – there is going to be a baby in the house. Not a rabbit baby (we call them kittens), but a human one. 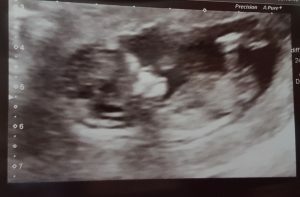 It will be joining us in November. I’m obviously not gestating it. My human mum is. If I were doing the gestating, I’d grow more than one at a time (far more efficient) and I’d have been done long ago – this non rabbit baby has been growing for months! This is incredibly exciting news for me in particular. Both of my brothers are strongly bonded with one of the existing humans. Ned with our mum and Gingee with our dad. I like both humans, but not as much as the boys seem to. So I have decided that this new human is mine! Ned and Gingee, being boys, don’t really know too much about how new rabbits are made, and they’ve had lots of questions for me. 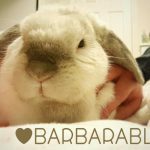 If you’re a fellow rabbit feeling a bit daunted about the arrival of a new human baby, I’m here to share my advice with you as well! How long do humans take to grow their babies? How many human babies are born at once? It usually seems to be just the one! I know, how inefficient! Apparently my human dad’s grandmother had a litter of two once, which is still on the small side in my mind, but it sounds like my humans are just planning on one at a time. Why is my human mum not nesting properly? Mine struggles. I judge her nesting skills a lot, actually. I don’t think she knows how to do this. She’s not put out any extra hay or anything. I haven’t seen her pull any of her hair out, either. If she’s not putting any hay out, take her some. Lay it on the floor of her bedroom or wherever you think she’ll want her nest to be. If she doesn’t use it to nest with, all rabbits know that eating hay is also really important during pregnancy. Mine wasn’t particularly appreciative of my bringing her the hay, but it was always gone by the time I went back in, so she must have been eating it. Small dark spaces are good to give birth in. Does she go into any of her own free will? If not, try to lead her into some – under the bed, perhaps. Go in there and she’ll eventually have to try and follow you! If it’s getting to the point that you think the baby will be born soon and she’s still not doing anything, take it up a notch. Lately, I’ve decided I have to make it clear just exactly what she should do, so I’m treating Ned as my baby. He’s small enough. I’ve started pulling some of my fur out and making it into a nest for him in his house. She’s noticed and commented on it, so I hope that encourages her to do the same! How do I best communicate with the human baby? Before it’s born, a human baby is much the same as a rabbit baby. You can sometimes see and feel it moving around. I try and give it a nuzzle or a headbutt at this point to encourage bonding. I hear human babies are very loud and smell bad. Is this true? What do human babies look like? From the pictures I’ve seen (see above), they’re black and white with no discernible features. I presume that, like rabbit babies, they grow into their features later on. I mean, we’re born hairless with our eyes shut and tiny ears. Look at me now – huge eyes, magnificent fur and my ears are just the right length. What do human babies do? I think they eat a lot. And sleep. And poo. This is why I think I’m going to have such a great bond with this baby – we will have so much in common! What’s in this for me? 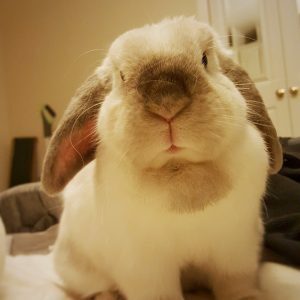 Wouldn’t it be easier to ask for a new rabbit baby? But it occurs to me that there are also lots of fun possibilities coming up too. Firstly, my mum is going to get a whole year off work. That’s a year where she’ll be home during the day. More playtime? Secondly, when the baby can open its eyes and walk (that’s at a few days old, right? It would be if it were a rabbit baby!) chances are it will be a bit bigger than I am. But it might not know the rules yet! So I can probably convince it to open the food bin more regularly and hand out treats. Similarly, opposable thumbs! Baby can use knives and cut up apples for me on demand! Open doors! And, as I don’t think they can talk at first, there’s no way I can be asked to go in for a bit or told no! Also, I hear the number of blankets in the house will increase. I like blankets. Human baby, you and I are going to have a lot of fun. Until next time, my furry friends! Sign me up to the weekly newsletter!